For several days leading up to Halloween in the early 1960’s in my hometown or Derby, Maine, several friends and I worked diligently to convert an upstairs barn loft into a Halloween Haunted House. The Kinney home was the first house going up Derby Hill towards Milo, and their attached barn was more like a 4 car garage with a stairway to the upper level with empty storage rather than the layout of a traditional dairy barn. 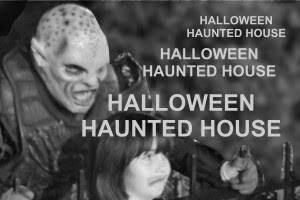 Was our Halloween project hokey or any less sophisticated than a commercial haunted house? Nope. We began with a layout of aisles by hanging blankets that provided a pathway for a guided tour with some very imaginative spooky experiences. The guide held a small flashlight, and would take local kiddies through the darkened barn for encounters with a variety of sights and sounds intended to give them goosebumps. It worked. A couple friends remained out of sight in the dark and provided well timed Halloween noises including groans, howls, and clanking chains. In more than one place we strung a dozen or more vertical lines of thread across the path which brushed the youngster’s face simulating spider webs. In another spot we had an inflatable raft on the floor. Once the guest took a step or two and reacted to the squishy sensation, the guide would caution them to avoid stepping on any dead bodies. The howls and shrieks were priceless even though the best was yet to come. The barn loft had no ceiling. The walls went perhaps 20 feet to the peak of the roof. The space between the inner and outer board walls was less than a foot, and some boards were missing near the very top. There were a few broken boards about chest high near the floor level, and the empty space between vertical studs of the inner and outer wall provided a rare opportunity for a grand finale. The youngest member of the haunted house team was skinny and agile enough to enter the wall spacing at the very top and crawl down inside between the studs to the floor level. As the dimly lit exit of the haunted house tour appeared in sight on the last aisle, the guest continued to walk slowly just ahead of the guide while thinking the show was over. With perfect timing the guide shined his flashlight on one of the chest high holes in the wall. Immediately a live arm shot out of the wall clawing at the air as our skinny pal let out a blood curdling scream. The startled guest screamed even louder. In later years we never recreated the Derby Hill Halloween Haunted House. The memories, however, will last a lifetime.